Designed specifically for self-defense as an every-day carry weapon. 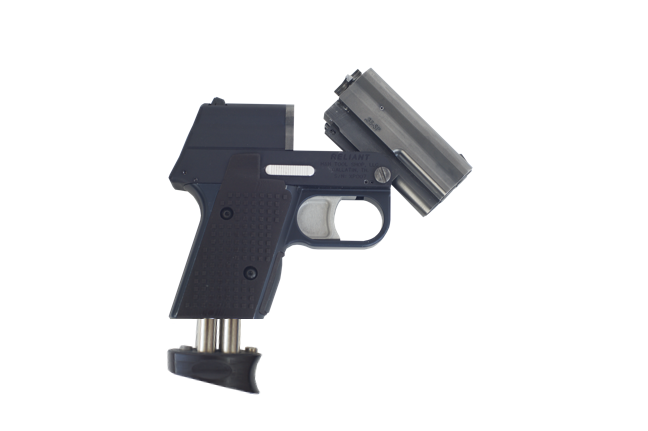 Signal 9 Defense developed the Reliant to be a firearm for everyone. It is easy to use, easily concealed in a holster, purse or bag with no external action, and it's comfortable to shoot. The Reliant will initially be offered in 3 calibers with interchangeable barrels. Signal 9 Defense has partnered with LaserMax to supply the Reliant with an optional integrated red or green laser. The laser will be controlled by a grip-activated switch located beneath the trigger guard. Note that initially we will not be shipping internationally. We will only be shipping to most US states. The Reliant is specifically designed for concealed carry, combining the reliability of a revolver with the profile of a 1911 pistol. The contoured grip is comfortable for all shooters it’s small size makes it easy to conceal. The Reliant is ready the moment you put your finger on the double action trigger. With no external action, it can be fired from “deep cover”, from inside a jacket pocket or other concealment. Reliant’s innovative design represents a true revolution in personal defense and is perfect for both a primary weapon or a backup gun for shooters of all experience levels. Firing action cannot be neutralized by an assailant grasping the gun. 4-round capacity with 4 shot speedloader in the grip. When the trigger is not being actuated, the firing pin will remain stationary at rest in between 2 of the chambers and behind a steel plate. This means that the firing pin is never behind a live round while at rest. The steel plate has 4 holes in it that are in line with each chamber. The firing pin passes through one of these holes to strike the primer. Finally, when the trigger is released, the cam indexes to the neutral position and the firing pin is again behind the steel plate. Accidental discharge is practically impossible. The trigger must be pulled in order for the firing pin to line up with a live round. In addition, all moving parts, other than the trigger and barrel release, are located internally unlike a revolver or automatic pistol. The benefit is that the firearm can be fired from concealment without the risk of jamming. Also, in a situation where an attacker grabs the firearm, the trigger and action can still fully operate through all trigger pulls unlike a revolver or auto. Finish:Various Hardcoat Anodized and Black Phosphate. Our engineers are working very hard to refine the Reliant for mass production. They are working closely with our manufacturing partners and will begin production soon. Once the designs are final and we have an approved production schedule, an estimated delivery date will be published. Go to our contact page and submit your email address and like us on facebook to stay informed. When will the Reliant ship? Where can I get a Reliant? The Reliant will be sold through reputable dealers across the country. You can ask your local dealer to contact their distibutors to enquire about offering the Reliant in their stores. How much will the Reliant cost? Please check the tab above titled "Availability & Pricing"
Will the Reliant be available in any other calibers? We do plan on offering the Reliant in additional calibers including .22lr, .22mag, and .17HMR. We have worked very hard to keep the Reliant as narrow as possible. Some higher pressure calibers require a wider barrel and frame. We will consider manufacturing these larger firearms if the demand allows it. Do all four barrels fire at once? No. Only one barrel fires at once. Each trigger pull indexes the firing pin to the next chamber. Click on the tab titles "Internal Action" above for a detailed description of the firing mechanism.